Build-your-own poké bowl restaurant expanding into the Inland Empire. AhiPoki Bowl, a fast casual build-your-own-poké bowl restaurant, is opening this Friday, July 22 in Moreno Valley, California at 12510 Day Street, Suite A. This location is the first location to open in the Inland Empire. The grand opening celebration and promotions will be on a later date, to be announced. This will be AhiPoki Bowl’s sixth location, with the first five locations in Hollywood, Temple City, City of Los Angeles, Chandler, and Scottsdale. There are plans to open 10 more locations throughout California and Arizona with the next opening in West Covina, CA. 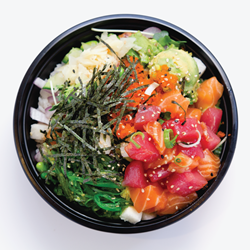 AhiPoki Bowl’s popular concept gives customers the opportunity to customize their own Hawaiian poké bowl by selecting seafood, unlimited toppings, and flavor sauce over white rice, brown rice or mixed greens. The seafood choices typically consists of tuna, yellowtail, albacore, salmon, octopus, scallop, and shrimp. In addition, there are seasonal specials like the Tuna Luau, a delicious mixture of ahi tuna and jicama, tossed with green onion, garlic soy mirin sauce, and a splash of sesame oil. Ahipoki Bowl serves the freshest sushi-grade seafood with only the best ingredients and spices inspired by Hawaii. The poké bowls are made to order every time, but beyond the quality is the guarantee with every poké dish served, there is a promise to deliver an affordable poké experience unlike any other. Fans can receive promotions and news by “Liking” AhiPoki Bowl on Facebook at http://www.facebook.com/ahipoki. For more information please visit http://www.AhiPokiBowl.com, @AhiPokiBowl on Twitter or @AhiPoki on Instagram.